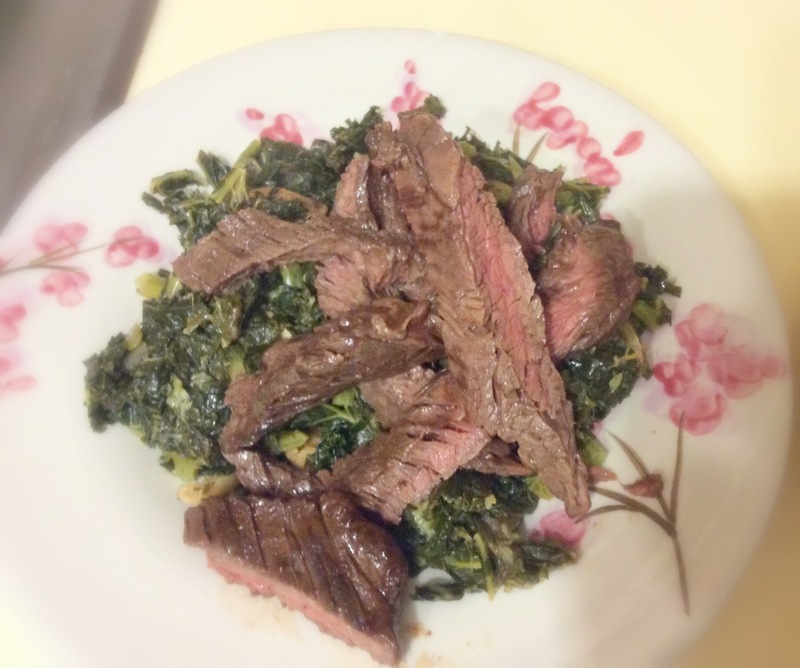 paleo beef recipes | Taste That! Ah it’s been too long! Seriously though, things got busy for awhile, and the holidays, and I didn’t do much to re-invent the world of food. 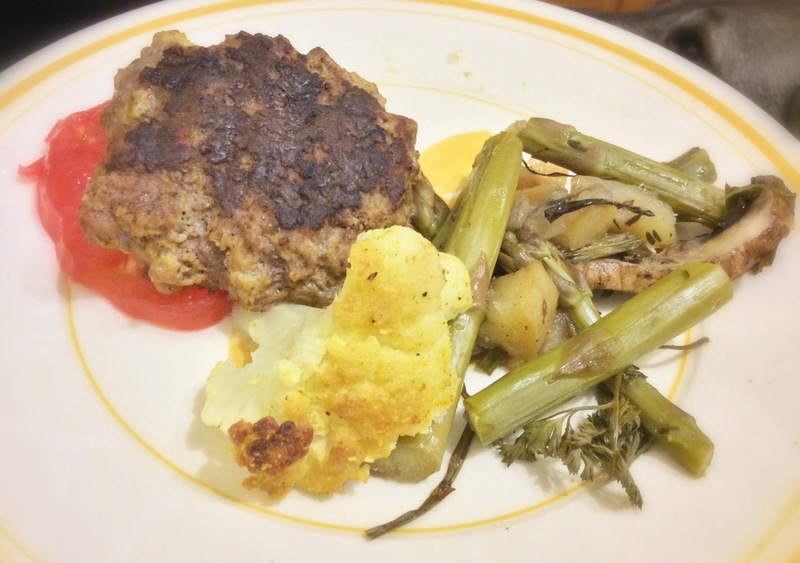 I went to a lot of staples, and simple un-blog-worthy dinners (They were still yummy, just not exciting enough for the pages…A girl has to draw the line right? Anyway, I was stressing out about posting things, and rule #1 is “if it starts causing too much negative energy and stress, take a step back and breath” – Stress management is part of this whole thing, so I took a little hiatus, and didn’t sweat it. Hope you all had plenty of recipes to tide you over! But I’m back! Today anyway, I just bought a new crock pot, since I realized that my 4.5 quart one was waaaay too small, and I bought a whopping 8.5 quart one to replace it! The exciting thing is now, even with the large amount of food that the two of us go through, I’ll actually have leftovers!! After much review scanning, I went with the 8.5 quart model from Elite Platinum, and so far I am thrilled with it! 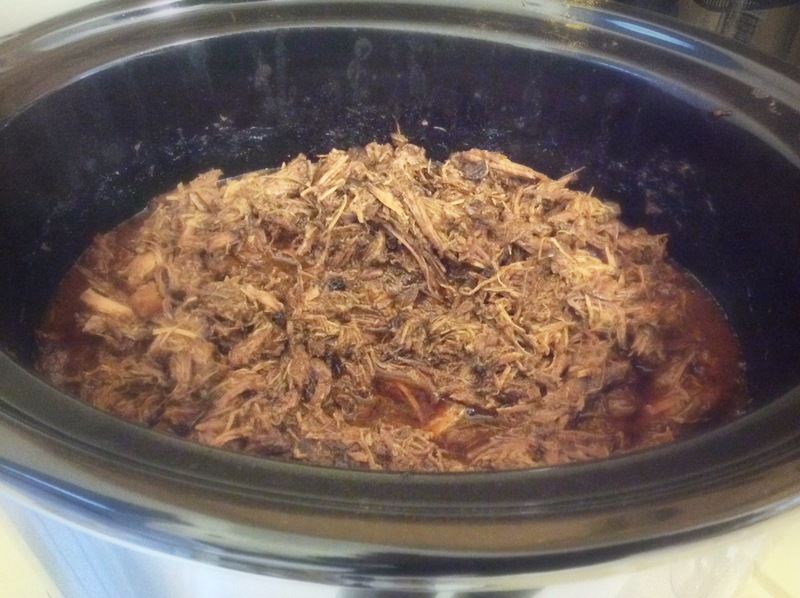 So my first recipe that I tried out in my new “big guy” crockpot, was some pulled beef. I wanted something that was tasty as a stand alone food, but something that could be versatile to eat throughout the week. Instead of keeping it SUPER simple. I totally made it weird and special, and it was utter magic let me tell you. I ate this stuff almost every day, and not only did it last all week (YAY FOOD!) but it was just as awesome tasting each time! I put it in Paleo Wraps, I put it over salad, I ate it straight from a bowl, I ate it as a side to eggs….seriously, it did not get old. Place all ingredients into the Crock Pot and cook on Low for 10-12 Hours, then shred and mix all ingredients with two forks. Cubes of beef chuck are perfect for stews and crock pot meals in general. Leeks, parsnips, and pearl onions compliment the meat well, and coconut milk adds some nice fat and creaminess. Chop everything up and cook on low for 8-12 hours, and enjoy a warm, comforting, hearty meal at the end of the day. I put my steak (2.5-3 lbs of yummy Flank Steak) in a ziplock Baggie, added my ingredients, and rolled it around and rubbed it to coat. I only Marinated My Steak for 20-30 min but you can play around with leaving it longer. Then I just thew it on the griddle until the middle reached 135 and let it rest for 10 min. That was a nice rare-medium rare. As always with a cut like flank steak, be sure to cut against the grain. I love Patty Pan squash, they are one of my favorite seasonal vegetables in the summer, Not only are they tasty, but they have such a fun shape, it’s hard NOT to get creative. I found some bigger ones at the Fairway Market that just opened up, so I grabbed them with stuffing in mind. I found some grass-fed ground beef for a reasonable price as well as some wild mushrooms, so I left with a mission for dinner the next day. If you really want to make this paleo or whole life challenge compliant, omit the goat cheese, but since my system handles it well, i decided to include it. 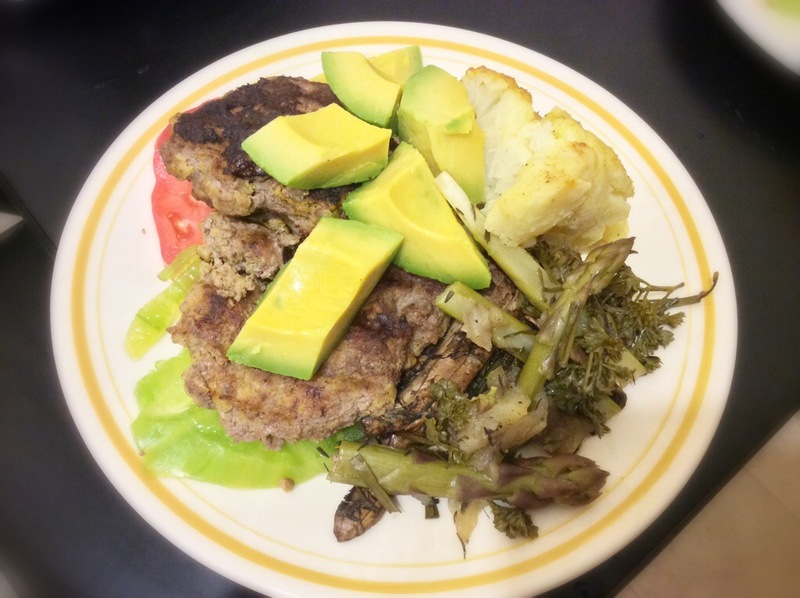 Bake patty pan at 350 for about 20-30 min while mostly cooking your filling. You WILL have extra filling. You just want to soften them up so you can easily scoop out the middle. Cut off the top, just enough to expose the seeds. Scoop out the seeds, along with a little of the flesh to form a bowl. You can chop up any flesh and add it back inside, mixed in with your stuffing. 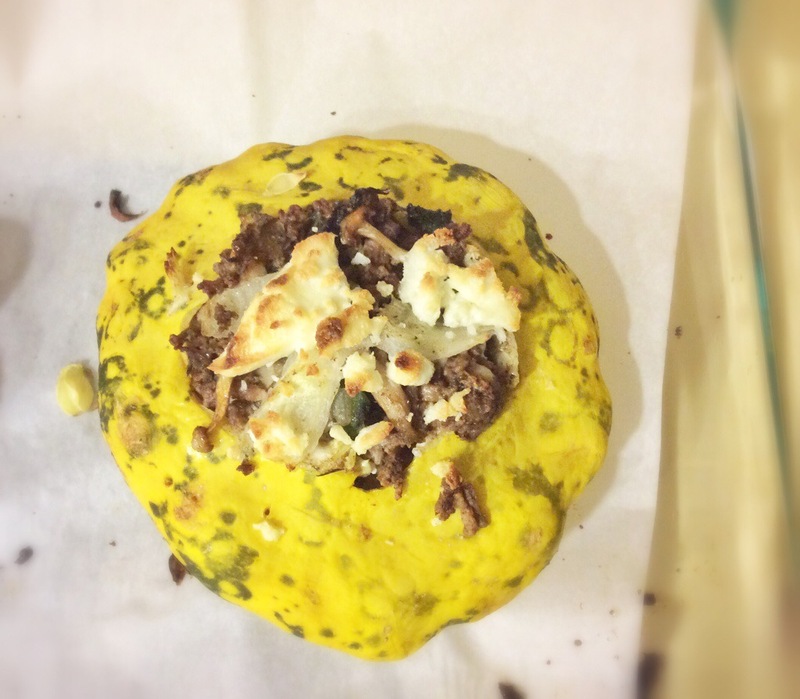 If you are going to add some goat cheese, mix it with the stuffing, and crumble a little on top as well. Bake for another 15 -20 minutes until the cheese is golden brown. The crock pot wins again! I swear I ate this for days and didn’t get sick of it. 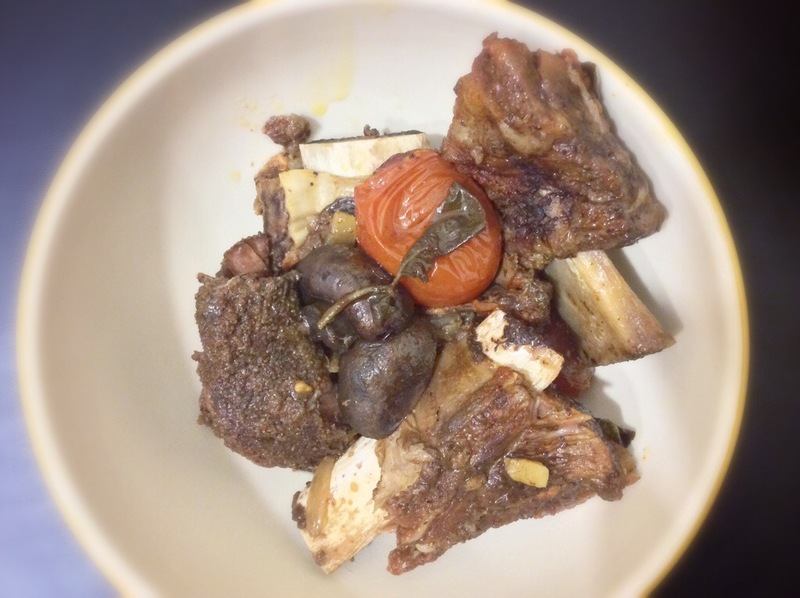 Now ideally you would use grass-fed short ribs (Try US Wellness Meats!) but I happened to buy a big ol’ value pack from BJs this time. Short ribs are awesome, but you HAVE to cook them slow. 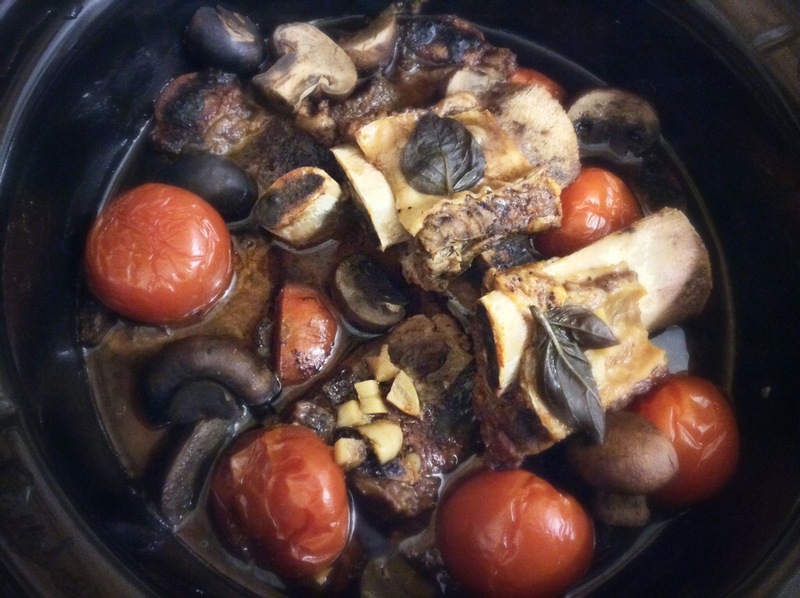 I’ve never had any luck cooking them any other way, they always come out tough and gross, but in the slow cooker they are DIVINE. By the end they are falling off the bone and tender, and I cannot think of a more lovely way to be greeted coming in from work. As for prep, there isn’t much. 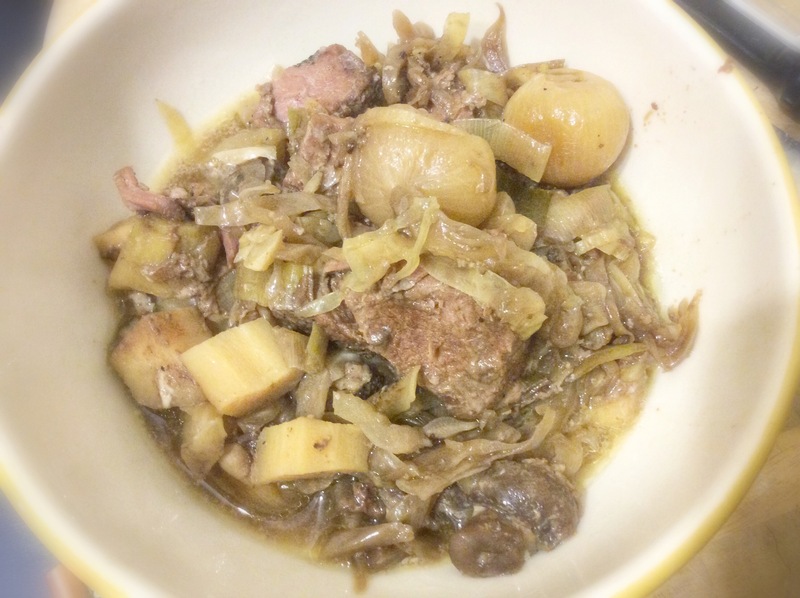 I threw the onions on the bottom, packed in the short-ribs, and threw the garlic in between. Then I piled the rest of the veggies on top, added any liquid, and cooked on low for 8-10 hours. Super simple and tasty! Be sure to go heavy on the fresh herbs and garlic! I swear, it’s the easiest foods that take me the longest to get up. I don’t know what it is. Anyway, anything resembling a burger is an easy fun way for me to make a relatively quick dinner. It doesn’t have to be plain and boring to be easy either. To make it interesting, it’s all in the spices, and additions. However, it still should be heavy on the meat and not too loaded with filler. 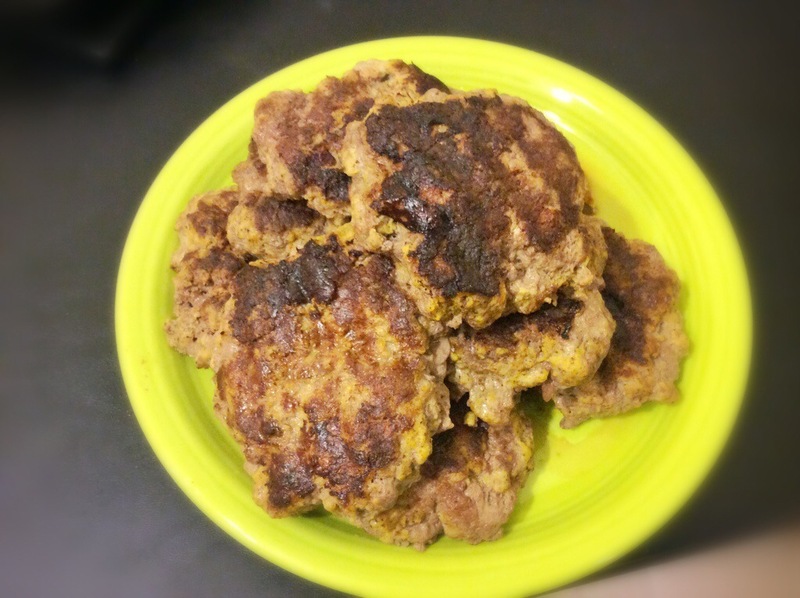 For these I took some simple sausage seasoning (mainly black pepper and sage) and added some canned pumpkin, to create these tasty and fun patties. Mix together all ingredients, and let rest for 10-15 minutes. It helps the flavors to meld together. 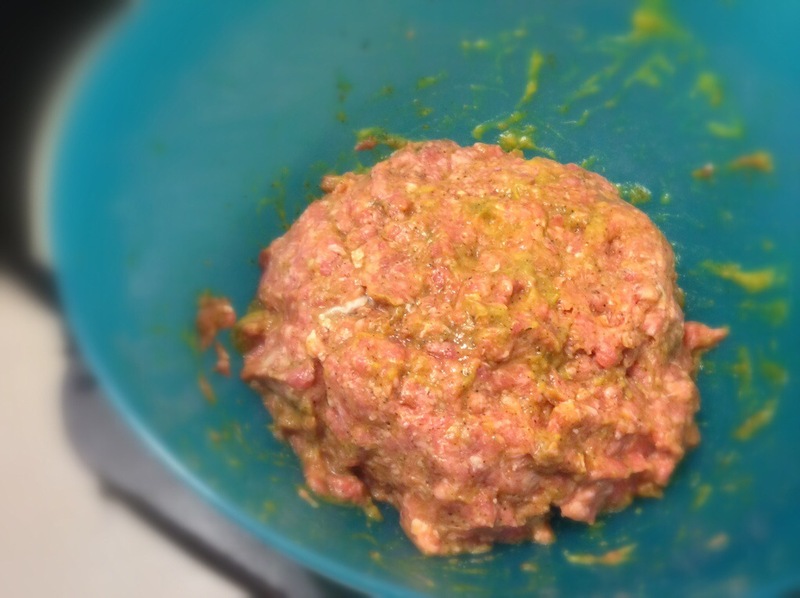 Form into small patties, and grill or cook to your desired doneness. This dish was actually supposed to have more ingredients, but I’m glad it didn’t. That sort of happy accident only happens when you wake up and immediately start chopping vegetables while also getting ready to leave for work. I originally was going to add sweet potatoes as well, but alas I forgot. I ALMOST forgot the apple, but I remembered mid-way through cooking, and got it in the pot! The meat I used was from US Wellness Meats which is my favorite place to get meat. I thawed it for 24 hours, and it was still slightly frozen, but I used it anyway. I rinsed the Sunchokes and cut them into chunks (each Sunchoke yielded roughly 6-8 pieces). The onion I peeled and quartered then I peeled the carrots and cut them into smaller chunks. The ends I left as circles, but I halved and quartered the slices as I got to the thicker end. The rutabagas I peeled and then cubed, Most of the mushrooms I kept whole, but a few of the larger ones I halved. Place everything into the crock pot. The brisket wouldn’t fit as is, so I cut it in half and put each half in sideways. This will depend entirely on the size and shape of your crock pot. I then added the seasonings, coconut aminos, and cabernet. I turned the crock pot on high and finished getting ready for work (about 30 minutes) turning it to low before I left. When I got home it had been around 8-9 hours. I realized (on looking at the 2 apples in my fruit basket) that I had forgot to add the apple. I sliced it into small-medium sized cubes, and added it into the pot. Then I turned it to high for the next hour, and then to low again for the next hour and a half after that. You probably don’t need to play with the temperature that much, but that’s what I did. All together it was cooking 11-12 hours, and it came out perfect.